Sign showing access to the pavement and shops from the bicycle lane. In all cities, big and small, it is sometimes necessary to carry out road works in order to maintain and develop the city. Doing this without bothering the users of the city is difficult but a city can make an active choice to prioritise certain types of road users over others. Copenhagen Municipality started a project with HOE360 Consulting in order to determine various initiatives and their effects when it comes to the passability for cyclists. The goal is to ensure cyclists good passability when they pass the numerous road works in the city now and in the future. The focus was on many aspects in connection with the setting up of road works, for instance closing off part of a street, traffic safety, the placing of signs, suitably wide temporary bicycle lanes and access between bicycle lane and pavement so that business owners ensure their customers’ access to their shops. Istedgade in Copenhagen, which was due an 18 month long thorough rebuilding, became the lab for a series of these initiatives which were established and tested. A catalogue of possible initiatives was developed that could ensure good and safe passability when a road is turned into a building site. But no rebuilding without a lot of mess. One of the initiatives we tested was to try to separate the cyclists into those actually going to Istedgade and those with Copenhagen Central station as their goal. This was done because the road works meant that temporary bicycle lanes had to be built that were sometimes narrow and therefore it would be a clear advantage if not all 5,500 daily cyclists would continue cycling along Istedgade but that some of these commuters were led by another route and thereby the pressure on Istedgade itself was eased. Sign with information on the alternative route and blue line. A concept was developed that showed the way for cyclists without errands in the street, that is primarily commuters, who were led down a parallel street. Signs with information on the alternative route were put up that the cyclists saw before they reached the road works. 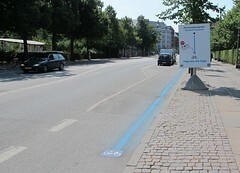 And by following the blue lines the cyclists could avoid road works and thereby get an easier cycle route. Just as important as guiding the cycling commuters around the road works was it to communicate that Istedgade was still a busy street full of life and open shops. Copenhagen Municipality wished to ensure good access to the shops in the street. Copenhagen Municipality made their anthropologist observe and talk to people. 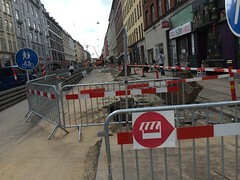 Overall Istedgade had worked satisfactorily during the road works but it was difficult for many to decode the signs and the blue line for the alternative route – those who knew its purpose, however, thought it worked well. The signs with information on access to the shops were too small according to many people and at the same time it was a challenge that the progress of the work meant that the access points were often moved so that the signs lost their function. However, the overall experiences when it came to alternative routes, ensuring access to the shops as well as the overall traffic flow and safety are valuable and will help future road works being carried out with an improved passability for cyclists. Every day 5,500 people cycle through Istedgade. The street will become a 30 km/h zone. At all crossroads special lighting is established. Selected crossroads get raised sections and are made narrower so that it will be easier to cross the road.